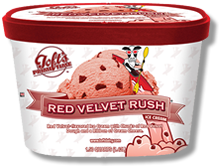 Our newest Prime Time­™ flavor, Red Velvet Rush, is being to your grocer’s ice cream freezers as you read this. Red Velvet­ flavored ice cream with chunks of red velvet dough and a ribbon of cream cheese gang up on your taste buds and peak your ice cream pleasure! Find out for yourself today why Real Ice Cream Tastes Like Toft’s!